It’s been a while since the last installment of the Nagging Question here at Cardboard Gods, but I find myself so full of questions today that it’s as if all the question marks for all my nagging questions are like fish hooks digging into the inside of my soured, constricting gut. Why did I not heed my own vow of two nights ago and take the day off from baseball yesterday? Why did I think things might actually turn out all right when another stout performance from young Clay Buchholz seemed to bring the Red Sox to the doorstep of victory, down a run and with two outs but with the bases clogged in the 7th inning and Julio Lugo at the plate? Why did I think Julio Lugo would make up for an entire lackluster season by lacing one into the gap? Why did I assume without even thinking about it that with the Red Sox season on the line Julio Lugo the multimillionaire would at least run hard to first base after failing to rip one into the gap? (He would have been safe had he hustled, the game would have been tied, the rally would have continued, with one of the Red Sox’ few remaining possessers of a pulse, Jacoby Ellsbury, at the plate.) Perhaps most of all, why do I care? I mean, why did I get viscerally angry at Julio Lugo, a man I’ve never met, wishing in that moment that I could punch him in the stomach or hurl rotten tomotoes in his direction? But I do care. So I add another question mark to the fish hooks in my gut this morning, the one at the end of this flailing inquiry: what the hell is going on? And why? This is the fault of the Dodgers. All year long, even when the Red Sox were rolling, the one major misfiring cog was the robotic and exasperatingly ineffective J.D. Drew. He has begun to hit a little better of late, but still has remained strangely inconsequential, a huge money pit not seen in Boston since the Big Dig. Has anyone suggested that as a nickname for him? J.D. “The Big Dig” Drew came from the Dodgers. Julio “Ah, Why Hustle?” Lugo also came from the Dodgers. Serial game-blower Eric “Gags” Gagne came from the Rangers, but surely in every baseball fan’s mind he is a Dodger. So I have to ask, what did we do to deserve this, Dodgers? Now, don’t misunderstand me, I don’t believe in curses and never have, except maybe for a few painful moments in 1986. But some days you wake up and just start looking for reasons, for someone or something to blame, and when no rational answer presents itself you start casting about for explanations beyond the rational. So maybe it started in the 1916 World Series. This was the Dodgers’ first chance to win a World Series, and the Red Sox, led by a young southpaw named Babe Ruth (who would never again surface in any talk of curses), dispatched them in short order, 4 games to 1, for their second straight World Series crown. The Dodgers would not win a World Series for many long hard years. One of the few players who performed well in the 1916 Series was outfielder Casey Stengel, who would go on to beat the Dodgers in several World Series as a manager of the Yankees. The Dodgers finally settled their score with the Yankees in 1955, but perhaps they still harbored a grudge against their 1916 foes, especially considering their heart and soul, Jackie Robinson, was, before joining the Dodgers, subjected to a humiliating dog-and-pony show tryout by the institutionally racist Red Sox (the last team to integrate their roster, with the formidable Pumpsie Green). The grudge, if it ever existed, seems to have dwindled when the Dodgers moved across country to Los Angeles. While some vestiges of it may have surfaced in 1986 with the trojan horse gift to the Red Sox from the Dodgers (via the Cubs) of a 100-RBI man housing an inability to field a key ground ball off the bat of Mookie Wilson, the grudge seemed altogether dead in 2004, when former Dodgers Pedro Martinez and Dave Roberts contributed heroically to creating, among other things, the happiest fan-related moment of my life. But then the Red Sox had to go and give the Dodgers Grady Little. This seems to have aroused decades-old enmity from the Dodger gods. You give us this Wooderson-voiced nincompoop to run our club, we’ll give you a plague of apathy and incompetence. 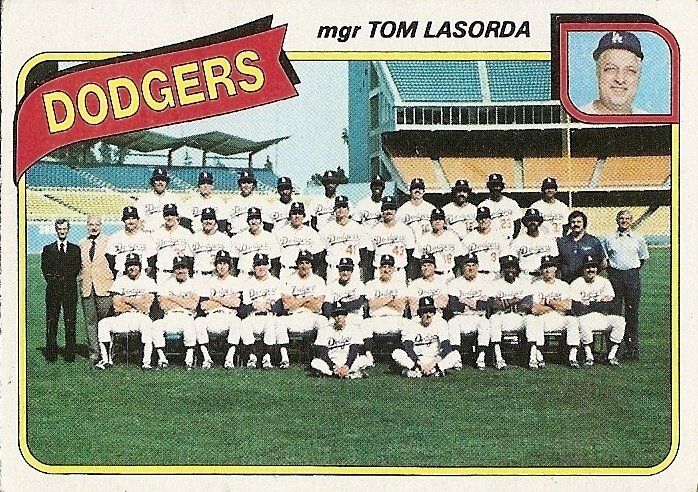 You are currently browsing the archives for the 1980 Dodgers category.